OK Go sounds and looks like a fun book about cars and transportation, but if you look closely at the "green" front cover with a bird juggling recyclables and take notice of the other characters holding plants, you'll get a better idea of what waits inside the cover. Tricky, tricky. I'll admit I was deceived by the title and the first few pages of sporty red cars galore, all go-go-going fast, fast, faster, that I didn't even notice them all spewing clouds of exhaust in their wake. Guess I just thought they were fluffy clouds in the sky. And then, UH-OH, things quickly get rather bleak and gray and the cars come to a screeching halt. Ah ha. The light bulb goes on in my brain. That will teach me not to read so fast and maybe slow down my life a little too. The things you miss by hurrying about. Better to take it a little slower like the book suggests and think about the consequences of your actions. Carin Berger's book is the most visually interesting environmental awareness picture book that I've ever read to my children. Her masterful cut paper collage illustrations get the point across with the use of very few words. Actually, the entire first half of the book uses only one word,"GO!" My daughter really liked the repetition of the word Go! And, as should be in a book about green living, all the collages are made out of recycled scraps of paper. Ingenious! There's so much to look at in the detailed collages that even though the book is meant for children ages 2-5, older kids and adults will enjoy perusing the pages as well, searching for the car that says "change" or "mustard." If you look really closely, you'll find Berger's daughter’s name, Thea and several other names as well. A large fold-out spread toward the back, gives ideas on how to live a greener life with messages, like "Use your feet, Pete" and "Plant a Tree, Marie." A parade of flower carrying creatures in the back of the book hold signs listing other ways kids can take care of the environment. School starts soon here and summer will come to an end. One of my very favorite autumn themed books is Berger's The Little Yellow Leaf . The captivating collage illustrations and tender story of a little leaf that hangs on until the end will touch your heart! Speaking of not wanting to let go, my daughter's first day of school is next week. Inspired by Carin Berger, we created a bus collage out of the coupons and ads in the Sunday paper. Berger will be glad to know that we took the message of OK Go to heart. Like the character Gus, my daughter plans to take the bus and save on gas! 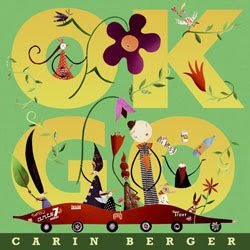 Thanks to Carin Berger, I'm giving away a copy of OK Go to a Brimful Curiosities reader. • Contest ends on Monday, September 7th, 2009 at 11:59 PM CST. Looks so cute. Thanks for sharing it! +1 I follow on Blogger. Thanks! Love the bus collage! Book sounds great! I would love to win! This sounds like a book I'd like to read to my class, then put in the classroom library for students to read and reread on their own. I love the illustration on the cover and the green message the book communicates to wee ones. Thanks! I'm also a follower via Blogger. I would love the chance to win this book. I am also a follower through Google Reader. Sounds like an interesting book! I will have to try the recycled paper collage project. I think my boys would like it! This looks like a very fun book! The illustrations sound wonderful, and I love that it teaches kids about the environment! The collage you and your daughter made is very cute! What a lovely book! My kids would enjoy it. I love the collage idea - I need to try that with my daughter! Your bus looks great! This would be great for my kindergarten classroom. I love that children are learning at a young age how important it is to care for the earth! This book looks wonderful! This looks like a sweet book and we are really sick of reading the same old ones! My Grands would love this. The collage is great too. 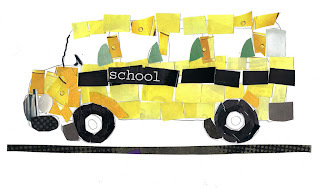 I'm starting to do a lot more arty activities with my kids and love your collage idea! We are also a pretty "green" family and I love to read books to my kids that share that message. wonderful description! Our school is trying to focus on green issues this year, so this would fit in perfectly. Thanks for sharing about this. We'd love to be entered in the contest. Would love to share this with my boys. We love books at this house and that one looks so fun! My 3-year-old loves books that are for "looking and talking" as he puts it. OK Go! sounds like a good book for us! Your bus collage came out really cute, too. What a charming book! It has such a lovely cover! I know this would be a perfect way to continue introducing things "green" to my kids. This looks like a great book, I would love to read it with my daughters and see how it sparks their imagination. I think my daughter would love the hidden surprises and the rhymes!